It’s no secret that we're huge fans of effortless dressing and will adopt any advice we can to make things easier when putting our outfits together. What if I told you that the addition of one easy accessory could make a world of difference when it comes to elevating your next ensemble? Plus, you’d get compliments to boot. It’s time to meet the new pendant earrings that are trending at the moment. This jewelry piece truly has the power to transform a whole look. In fact, you could be wearing the most basic of outfits and a pair of statement pendant earrings will instantly make the whole thing feel put-together. The best part is there is a style for everyone and at every price point. A minimalist will appreciate the clean, streamlined designs available in different metals. Those who lean more classic in their wardrobes will be happy to see the timeless styles that involve pearls and other pretty stones. As for those of you looking to add a fashion-forward or trendy piece to your mix, try this season’s coolest designs made of abstract resin shapes. They come in everything from bright colors to transparent styles. On a sidenote, these earrings make a great gift for a loved one, whether it’s for the holidays, a birthday, or just because. Keep reading to shop our roundup of the best pendant earrings online. We had a hard time picking out just one style for our own collections, so good luck! This modern design only looks expensive. We love a stylish bargain buy. Pearl earrings—especially with interesting shapes—are a major trend at the moment. When your earrings look like works of art. This abstract style elevates even the most basic of outfits. Earrings with face designs are popping up all over. Scoop these up for under $50. 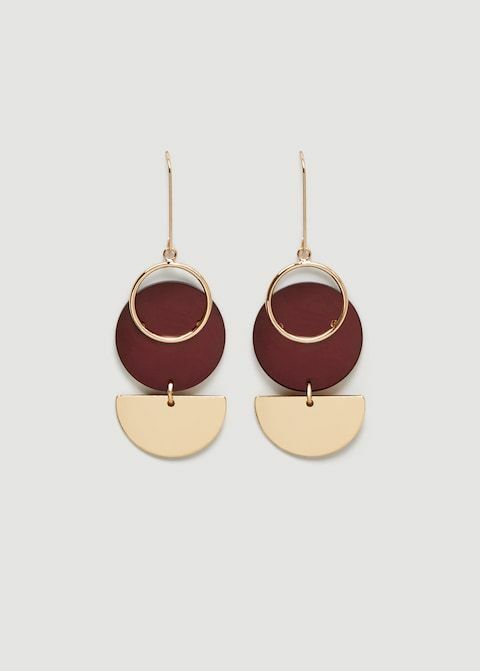 Whether you're a maximalist or minimalist, these long earrings will be right at home in your collection. Add some texture to your look with these tasseled earrings. How special are these whimsical beaded earrings? These rose gold beauties are extremely elegant—and perfect for a formal occasion. Resin earrings are all the rage this season. Picture these with a cool all-black outfit. We know we are. Pair these with a chunky beige turtleneck for a warm neutral look. We're getting intergalactic vibes from this blue-and-gold pair. These classic earrings can be worn for years to come. Plus they're giving us major Olsen twins vibes. These metal earrings are a minimalist's dream. These funky earrings have a retro feel that we love. These earrings are $20 but feel designer. We'd wear this drop pair with a chic black turtleneck. These would go great with a Scandi girl–inspired printed midi dress–and-sneakers combo. This playful transparent earring design is a definite conversation starter. An edgy-meets-polished outfit is what comes to mind when we see these designer earrings. Looking for more statement earring inspiration? Check out the latest earring trend to catch our eye.